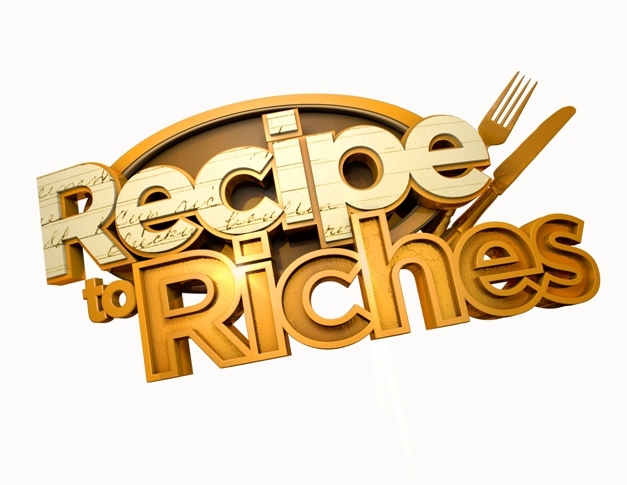 I first learned about Recipe to Riches from an email. The production team was trying to both drum up interest for applicants and to see if some local bloggers would be interested in auditioning. Yes, I was invited to audition for Recipes to Riches in that email and for a moment, I considered it. After a short deliberation, I didn't consider myself worthy nor have the time for such an endeavor. I love to cook, but did I have what it took to be one of the top 3 recipes in a specific category? Nope. I don't have that kind of confidence. Besides, I'd rather go out buy the winning products to try anyways. When I found out Mijune had earned her gold ticket to Toronto, I was really happy for her and waited eagerly to see if she made the show. Well, watching her on TV was kinda surreal, but fun at the same time - especially those high heels! While enjoying the first episode, Viv and I decided that it would be fun to try the winning recipe every week and then blog about it. 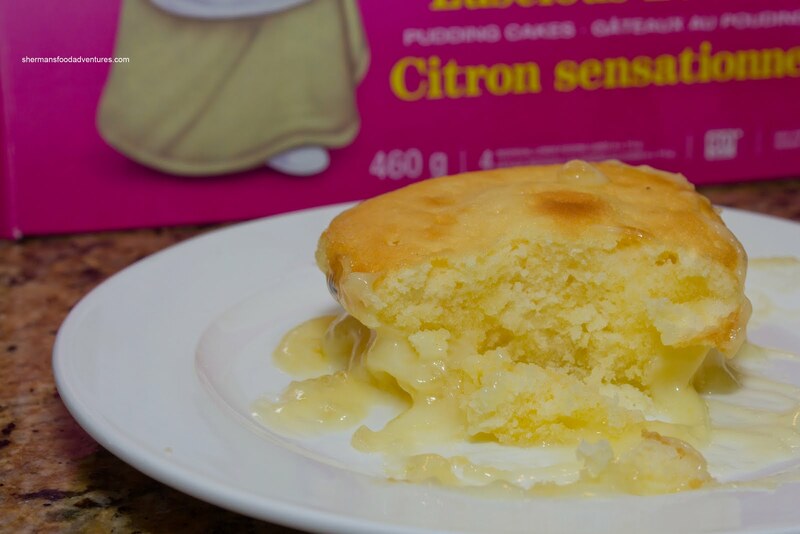 So without further ado, the winner of week 1 (Sweet Puddings and Pies) was Glo McNeill with her Luscious Lemon Cake. It's amazing such a simple recipe would win. I guess sometimes, simplicity does take the cake. These came in a box of 4 which were packaged in individual bakeable containers. Once cooked in the oven, these had to be gingerly removed along with the lemon sauce. Overall, the cake was moist and pleasant. We thought the lemon sauce was possibly too sweet. Viv and I felt this was a pretty simple recipe and were curious to see what lay ahead in the future episodes. peaches ended up on top. The peaches really did bring the cake together with a nice sweet pop and a hint of brandy. I really couldn't stop eating it. And became the early favourite to win in our opinion... until the following week's winner. 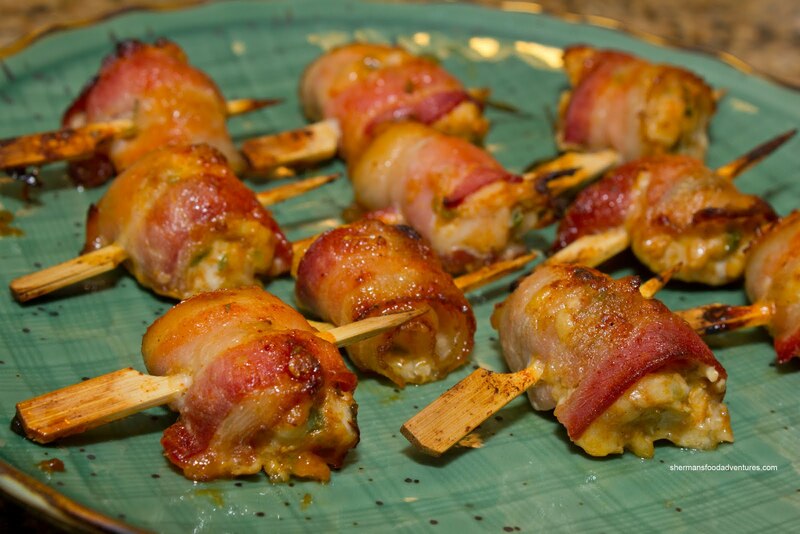 At first, when it was announced that John Grass' Chicken Grenades had won in the Appetizers category, it was not really all that surprising considering his competition (stuffed olives... really?). To some, this might have seemed like a really simple recipe to win anything, especially a national cooking competition. To be honest, that is exactly how Viv and I felt about it... until we tried a box. 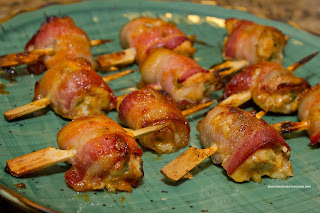 Each bacon-wrapped chicken morsel was skewered and kissed with a sweet and spicy jam which really made an impact. The combination of the smoky and salty bacon with the sweetness of the jam and the spicy zing of the jalapenos made for a flavour explosion. Again, such a simple dish, yet surprisingly effective. Another thing going against this dish was the cost - $8.99! 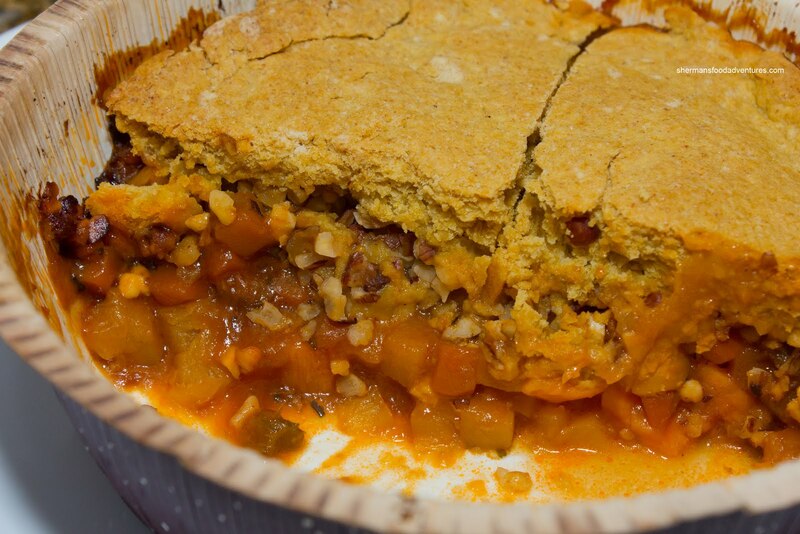 Now after 2 really good recipes, Week 4 (Savoury Pies) seemed like one of the most interesting items in the Savoury Bannock-Topped Pie by Melaney Gleeson-Lyall. 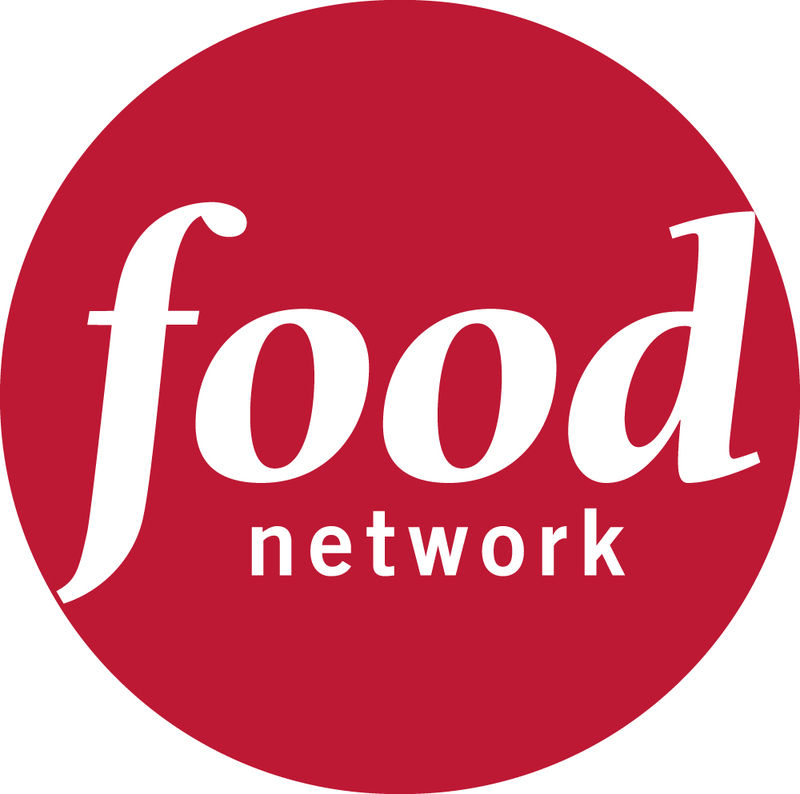 Watching the episode, we were pulling for her to win because her recipe was both different and intriguing. 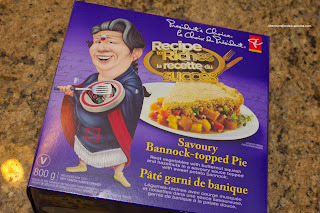 Personally, I love bannock and for it to be used in a savoury pie in place of a regular crust seemed like pure genius. When I opened up the box, there was frozen pie filling in a bakeable container. In a separate bag, there were the contents for the bannock. After baking the pie for 30 minutes, the bannock dough was placed on top and the pie baked for another 30 minutes. The result? Well, to be honest, a bland tasting mix of root veggies and hazelnut topped by a dense bannock. With that being said, when we took a scoop of everything plus a good helping of bannock, it made it slightly more bearable. Despite this, we didn't end up finishing the pie. It just really wasn't that tasty. We really wanted to like it. In the end, this was our least favourite recipe so far. And in conversation with others who had it as well, this was their least favourite too. 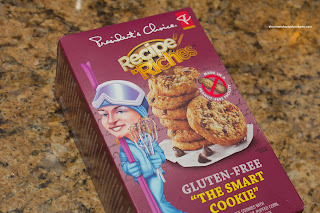 As we were watching Week 5 (Sweet and Savoury Snacks), it didn't seem possible for a gluten-free cookie to have a shot at winning. C'mon, anything missing something important such as flour usually results in a marginal product fit only for those who need to eat it. Again, we were so wrong. Not only did the cookie win, it appeared that many people liked it. So off I went to Superstore for the 5th time in 5 weeks to purchase Sonya Walos' Gluten Free "The Smart Cookie". Once home, we all dug into it and you know what? 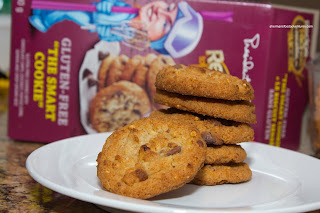 For a gluten-free product, they were right, it was pretty good. Sure, it had a bit of grit and it did not exactly erase my yearning for a flour-based product. Yet, there was a nice crunch, a balanced sweetness and chocolate chips (product has now been disqualified). The episode for week 6 (Frozen Treats) was PVR'd because life got kind of busy. 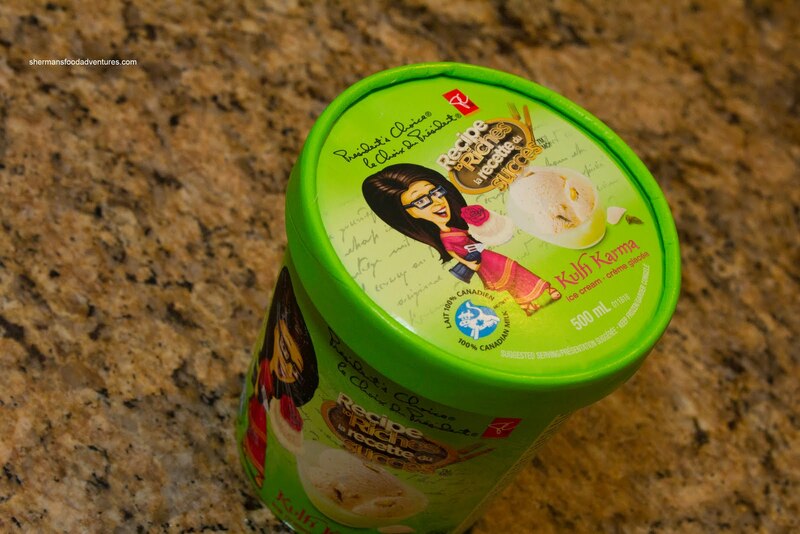 Therefore, I didn't get a chance to purchase Rosy Banwait-Soobrattee's Kulfi Karma Ice Cream until the following week. 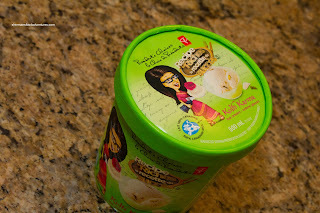 By that time, the stock of the ice cream began dwindling. Could it be that the show was beginning to attract a larger audience? What I do know is there were plenty of Bannock Pies left... As for the ice cream, it was definitely light and airy. Seems like they whipped it to achieve that consistency. One taste and the "ethnic" flavour really announced itself. 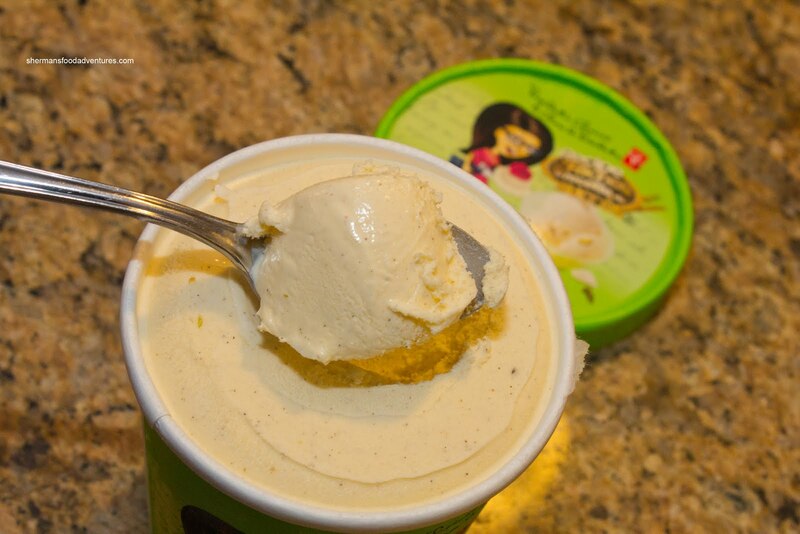 For an ice cream to stand out, it has to be something no one has ever tried before. In this case, it succeeded. 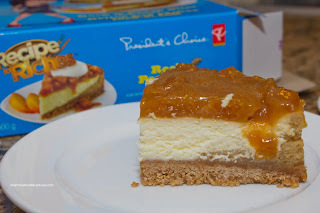 Now, I'm not sure if the flavour is for everyone, but for us, it was not bad. We could taste the cardamom after the initial hit of sweetness from the condensed milk. The rose water added a hint of fragrance as well as another layer of sweetness. Unfortunately, due to mass production, the pistachios that were originally a topping, were mixed into the ice cream. Thus, they not only lost their crunch, the resulting soggy texture was not appealing at all. 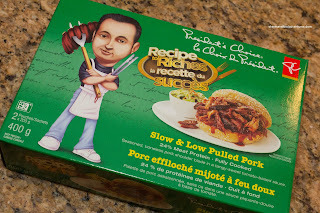 Now since we were already a week behind, I didn't get a chance to make it out to Superstore to buy Robert Luft's Slow & Low Pulled Pork until late into the weekend. To my utter surprise, they were sold out of the pulled pork! So off I went to another location and the same story... Did the show suddenly take off and viewers flocked to Superstore in search of the most recent winner? 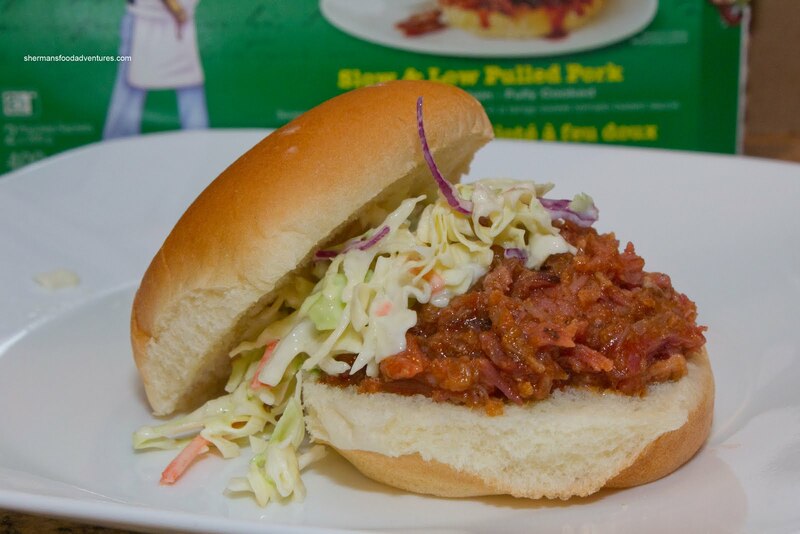 Or was the pulled pork the most popular of all? Maybe it was the least scary of any of the other products? Not sure, but it took my third kick at the can to score a box of it. And there were only a few left at the last Superstore I visited. Simply vacuum-sealed and frozen in 2 individual packets, you have to buy the buns and coleslaw separately. Therefore, everyone will have their own unique experience with the product. Well, unless you just eat it straight from the bag. I ended up buying Wonderbread white hamburger buns, Dole coleslaw and Kraft dressing. Sure, I wasn't being very creative here, but I didn't care, it was all about the pulled pork. Now, I have made pulled pork before and believe me, it ain't rocket science. With that being said, to put the whole package together in terms of texture, sauce and consistency, that is another story. Viv and I felt that the Slow & Low Pulled Pork was pretty decent. 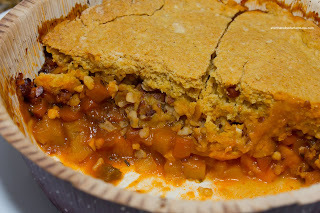 It had a wonderful meaty consistency that was moist and tender. The sauce was the right thickness and packed quite a lot of flavour. However, we did think that the sweetness level was a bit too high. More acidity or smokiness would've balanced it out better. 6. 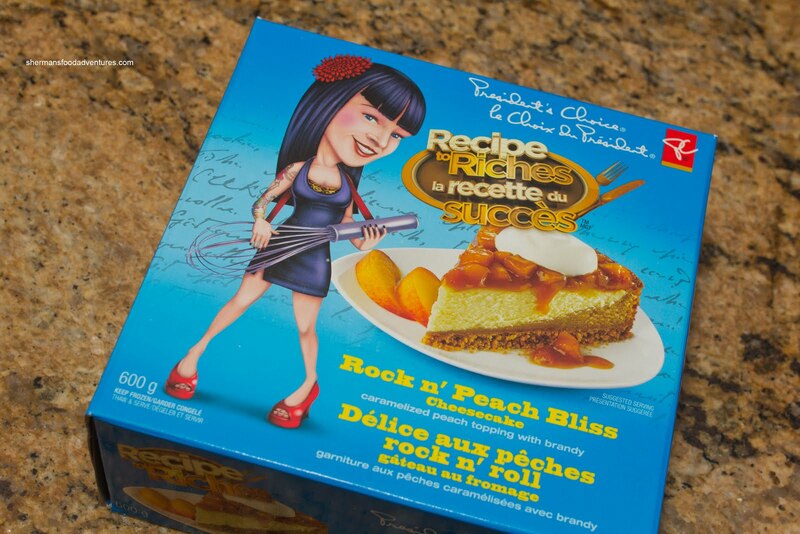 Gluten Free "The Smart Cookie"
The reason I chose the peach cheesecake as my top choice is two-fold. First, I felt that the flavours were bold and unique. Second, the difficulty level in making such a dessert is higher than some of the other products. 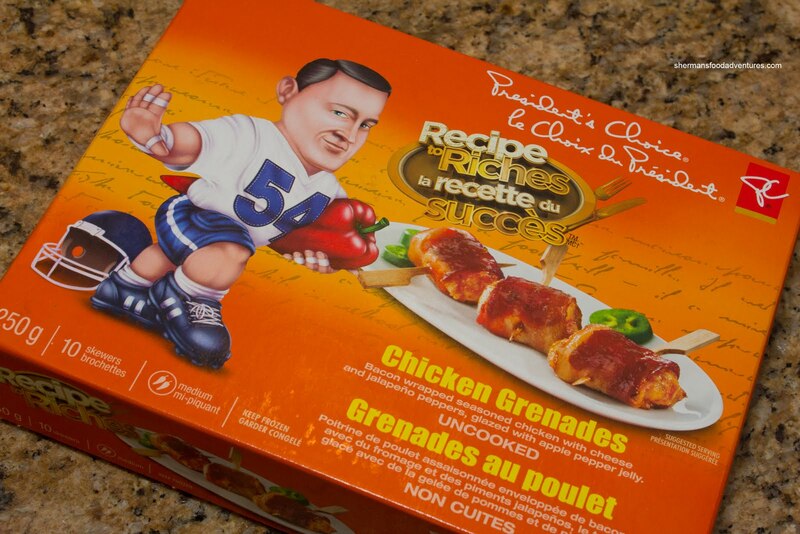 I put the chicken grenades second because they were plain tasty. Don't care about the simplicity nor the price. And frankly, I know it doesn't really have a chance to win either. The pulled pork was yet another item that one could make at home and for much cheaper, yet I felt that the overall product was good enough to place 3rd despite the sweetness. Furthermore, it is "mainstream" enough for the general customer. 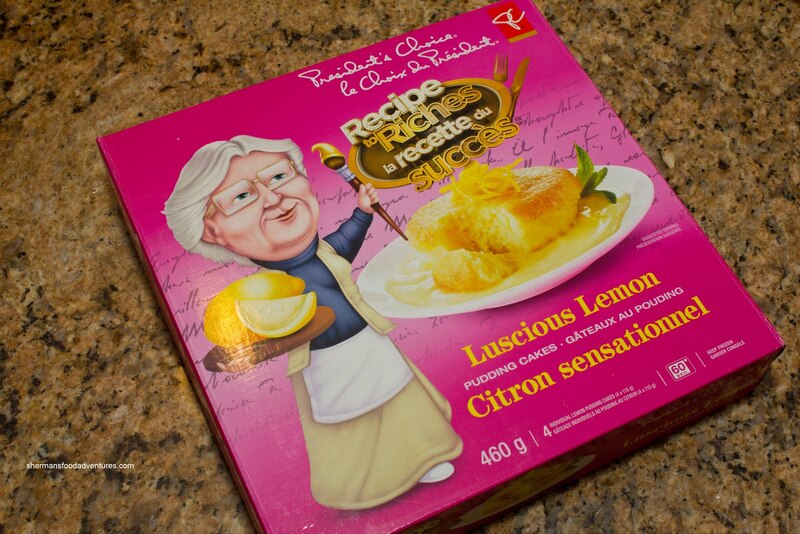 Nothing particularly wrong with the lemon cake other than the fact I thought it was slightly boring. I put it 4th for the sole reason of being "mainstream". Nothing ground breaking nor special about it, but it will sell and legitimately has a chance win despite what I think. The ice cream places 5th because it is possibly "too" different. I personally enjoyed it. However, it also doesn't have a chance to win due to the "ethnic" taste. Not sure the general public can warm up to that product. The gluten free cookie finishes in 6th for no other reason that there were better products ahead of it. And of course, the bannock pie slots in at 7th since it was not our favourite due to the lack of flavour. So congrats to the weekly winners and we'll have to see who will ultimately prevail on December 14th. For now voting starts today on December 7th. @WorthSwitching4: "Sonya has an immediate family member who works for an entity involved with RtoR. As a result, she has been disqualified." SHERMAN!!!! You are awesome!!! I love how you tried them all and thank YOU for encouraging me to take the bait and try out for the show. If it wasn't for you and my one other friend who called me to push me to do it.. I would have missed out. I really have you to thank! I didn't win, but hey.. there's always next time right?! You're fair in your assessment and I can't wait to see who wins. I gotta support my cateogry, but I also wish I tried them all!! I know we have similar tastes though so I bet I'd more or less agree with your thoughts. @Mijune You know you are a star. You will have your time. I believe in you!